National Nutrition Month(R) starts today. And while perhaps the people most excited about National Nutrition Month are dietitians and health professionals such as myself, it’s as good a time as any to reassess your health and put renewed focus on your wellness goals. The American Dietetic Association created National Nutrition Month as a way to increase attention on developing or maintaining a healthy lifestyle. 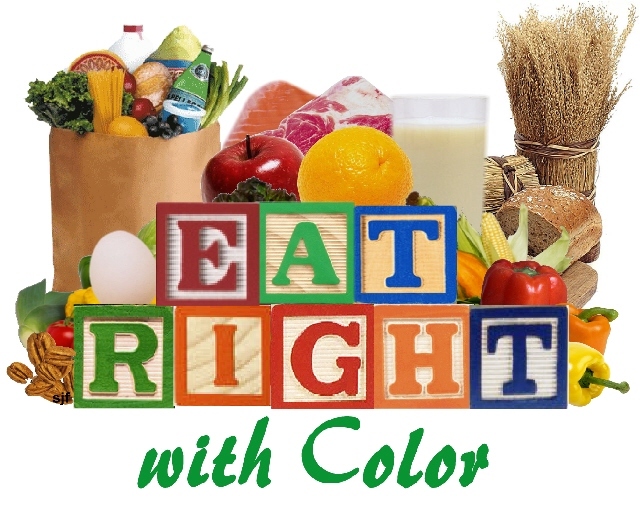 This year’s theme is “Eat Right…With Color,” emphasizing the importance of increasing one’s palate with a palette of food colors. I’m totally on board with the idea of challenging ourselves with eating a rainbow of foods as a way to increase dietary variety and nutrients. However, I feel that as a goal it might be too limiting, and I’d rather challenge my clients and friends to focus on goals that best meet their current needs. Assessing what’s working – and not working – for you and you only, and making small steps to change your behavior in order to meet your goals, is the best way to achieve success. So, maybe you do need to eat more purple or orange foods. Or, maybe you eat a lot of different colors, but your downfall is the 3 p.m. vending machine raid. Wherever you are today in your wellness journey, take an assessment, think about a change, and make one – just one – goal. At least for today. To help you, each day this month I’ll blog about a particular goal to consider. Some may resonate with you…some may not. For today, and to set us up this month, I want you to think about a single goal you want to focus on this week. Make it challenging, but achievable. By the end of the month, you may have 5, or 30, small goals to focus on this month and into the next month. Or some ideas that you can save until you feel good about your new habit and are ready to move onto the next goal. My goal? To seek out the furthest parking space to park my car, forcing me to walk further to my destination. Now that the weather is getting nicer, I want to take advantage of ice-free streets and every minute of sunshine I can get, so giving me just an extra minute or two of parking lot-walks will help me get in some exercise – and some fresh air. I’ll try it for a week, see how I like it…and then either make it a habit or take on a new goal.